When the new Swift just existed in words in Pakistan, somehow, one Pakwheels’ member caught hold of few spy shots. The spy shots were taken during its advertisement shoot and it didn’t quite please Pak Suzuki very much infact they were offended. 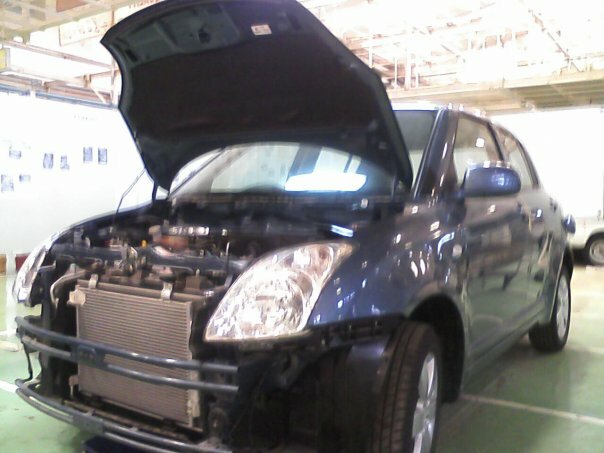 Even though the model of Swift which Pakistan was going to embrace in 2010, was seeing its departure in the rest of the world but still Pak Suzuki insisted the Director of the advertisement who in turn persuaded the Pakwheels’ member who posted the photos to take them down. However, Pak Suzuki didn’t directly intervened to get the photos down but the director definitely felt the heat from Pak Suzuki and asked everyone to please take the pictures down as this was critical. It was a 5-year-old model of Suzuki which had completed its design life-cycle in the whole world and was about to see design refreshment in the foreign markets and above all, it was a Suzuki so anyone could care less about it. Carmakers around the world apply heavy camouflage to hide their designs/cars from the public’s cameras, in the first few years of a new model’s development and then gradually, little by little reveal the car for those cameras. In the final days of the car’s launched, especially fans have seen the car by joining loose ends, carmaker’s design language and alas they photoshop the exact car which the carmaker is going to launch. Carmakers believe that this way there own product is being advertised and very useful feedback is being absorbed from the public way before the product is finalized and at a time when they actually can configure the product to the feedback, during the developmental stage. Similarly, the director of the swift advertisement could have let go of the photos and instead used them as teaser photos but I guess they lack creativity? The whole saga took place in December 2009, and might you wonder why I brought this issue back again. Well, I was reminded of Pakwheels’ incident by what has happened with a Brazillian Autoblog when it published a few spy shots of Toyota Corolla. Noticias Automotivas was forced to take down the spy shots and has been refrained by Toyota from using their name on the Noticias Automotivas website ever again, not a single person in this world is pleased on this story. Head over to Jalopnik to read the whole story. Click here. ^Then don’t comment if you don’t care. Just got access to the Internet?